We’d love your help. Let us know what’s wrong with this preview of My Fate According to the Butterfly by Gail D. Villanueva. When superstitious Sab sees a giant black butterfly, an omen of death, she knows that she's doomed! According to legend, she has one week before her fate catches up with her -- Light and deep, smart and funny, crushing and hopeful all at the same time, My Fate According to the Butterfly will open your eyes to both the world's potential for magic, and to its harsh realities. To ask other readers questions about My Fate According to the Butterfly, please sign up. "Sab embarks on a quest that sends her on a collision course with the realities of Manila and the war on drugs"
ANOTHER BOOK ON THE WAR ON DRUGS IN MY OWN COUNTRY. WELL, WELL, WELL, THIS IS DEFINITELY ON THE TOP TIER OF MY WANT TO READ BOOKS NEXT YEAR!!! "Determined to reconcile her journalist older sister and their father before her time is up, Sab embarks on a quest that sends her on a collision course with the realities of Manila and the war on drugs." this is a book based on the philippines. A BOOK BASED ON AND SET IN THE PHILIPPINES. i could cry. like, seriously. i can't wait for 2019. I was so honored to be able to read an early copy of MY FATE ACCORDING TO THE BUTTERFLY. The story follows Sab, a ten-year-old Filipina girl living in Manila. When Sab receives a death omen that she may not make it to her eleventh birthday, she goes on a mission to reunite her father and older sister. Her journey forces her to confront not only the harsh realities of the war on drugs, but also how addiction has impacted her own family. I ADORED this book. It was heart-warming, tear-jerking, and a I was so honored to be able to read an early copy of MY FATE ACCORDING TO THE BUTTERFLY. The story follows Sab, a ten-year-old Filipina girl living in Manila. When Sab receives a death omen that she may not make it to her eleventh birthday, she goes on a mission to reunite her father and older sister. Her journey forces her to confront not only the harsh realities of the war on drugs, but also how addiction has impacted her own family. I ADORED this book. It was heart-warming, tear-jerking, and also hilarious at times. Sab’s voice is fresh and relatable. She’s a girl who may not realize she’s actually the glue that’s been holding her family together and it makes perfect sense that she would be the one to attempt to reunite her older sister with their estranged father. While family is a big theme in this book, the heart of this story for me is the sibling relationship between Nadine and Sab. Their age difference is often a source of conflict, but these girls love and support each other unconditionally, and it’s Nadine who helps Sab process her feelings when she discovers the truth about their father’s past. 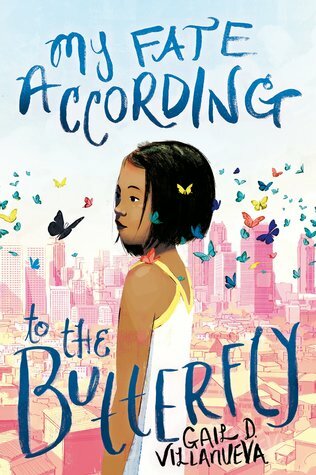 Set in Manila, MY FATE ACCORDING TO THE BUTTERFLY is vibrant, saturated with beautiful cultural elements that are easy even for an outsider to understand. Gail D. Villaneuva discusses the war on drugs in a way that is age-appropriate but still examines how economic privilege and race intersect with crime and addiction. Additionally, readers get a glimpse of how colonial mentality and colorism operate in the Philippines and how these things affect children today. The MC is superstitious, which I can totally understand haha, and the real way that the Philippines way of life is portrayed, warts and all, is very very admirable. I got to read the opening to this and it's SO SO GOOD! Can't wait to read the whole book! Huh. Thinking over some things in the book. Not quite sure how to rate and review right now, but if someone were to ask me about my thoughts in person, I might be able to discuss it. Gail D. Villanueva is a Filipina author born and based in the Philippines. She’s also a web designer, an entrepreneur, and a graphic artist. She loves pineapple pizza, seafood, and chocolate, but not in a single dish together (eww). Gail and her husband live in the outskirts of Manila with their dogs, ducks, turtles, cats, and one friendly but lonesome chicken. My Fate According to the Butterfly is Gail D. Villanueva is a Filipina author born and based in the Philippines. She’s also a web designer, an entrepreneur, and a graphic artist. She loves pineapple pizza, seafood, and chocolate, but not in a single dish together (eww). Gail and her husband live in the outskirts of Manila with their dogs, ducks, turtles, cats, and one friendly but lonesome chicken.